In recent years we could see trials with pedestrian zones in cities around the world. The New York “Plaza’s” are very successful and spreading. Other cities are lagging behind, or they are just waking up, like London, where “Problems with congestion, pollution and safety need to be resolved”. Pedestrianization would help there. In the Netherlands almost all cities already have a pedestrianized city centre. That isn’t a recent development: they have had these areas for decades. How did that happen? Today 49 years ago, the 6th of November 1965, Utrecht started a large-scale experiment with car free shopping streets. The national press followed it with great interest and even the news service for the cinemas reported about it. That is the reason why I can now show you very interesting moving images. The experiment was a big success and this eventually led to all those car free city centres. Utrecht was not the first city in the Netherlands to have car free streets. That honour goes to Rotterdam. Its city centre had been levelled by Nazi bombs in World War II, but it was soon rebuilt and already in 1949 construction started for the world’s first car free shopping street, Lijnbaan, that was finished and opened in 1953. 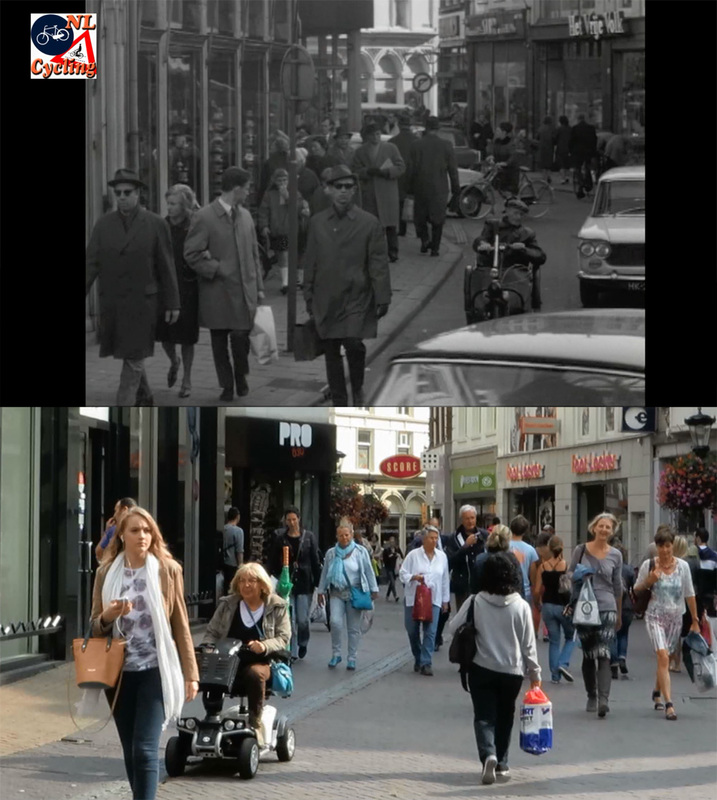 More than a decade before Copenhagen’s first car free street became permanently car free in 1964. Utrecht already had some earlier car free streets too. Plans to pedestrianize the Lijnmarkt* date from 1962. The Oudegracht was apparently also partly car free. What was so special about the 1965 experiment, however, was that it no longer concerned just one or two streets, but an entire zone in the city centre, comprising the most important shopping streets. From Saturday 6th November 1965, at exactly 1 pm, the streets were closed off by the police. In those days people still had to work and children even went to school on Saturday mornings, so that it was only during the afternoons made perfect sense. All cars had to leave the area completely. Parking was also prohibited. People were allowed to take their bicycles into the area, but only if they dismounted. You can see a lot of people walking with their bicycles in the video. 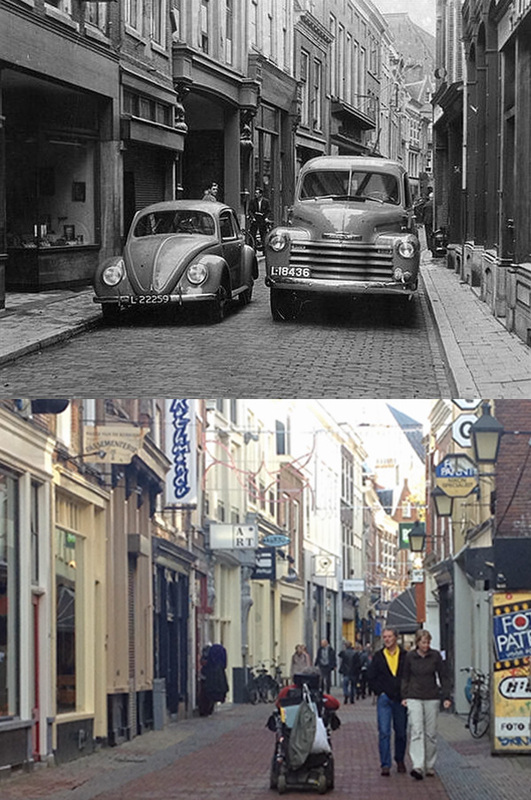 Lange Elisabethstraat in Utrecht before the experiment in 1965 and in 2014. The arches in the façade in the far distance show that this really is the exact same location. The experiment was planned to take half a year, but in reality the trial would last a full year. The end conclusion was that the experiment was a huge success. And the trial would soon be expanded to Wednesday afternoons. The afternoon children did not have to go to school. The initiative for the car free streets had come from an unexpected party. A contemporary Utrecht newspaper reported: “This measure is a result of an initiative of the Utrecht police. The arrangement took shape in close consultation with the Chamber of Commerce, the Association of Small-Businesses and the Utrecht authorities.” That the police came up with this idea may be a result of the fact, that the streets were so narrow and full of dangerous motor traffic, that the safety for especially the most vulnerable traffic users was at stake. 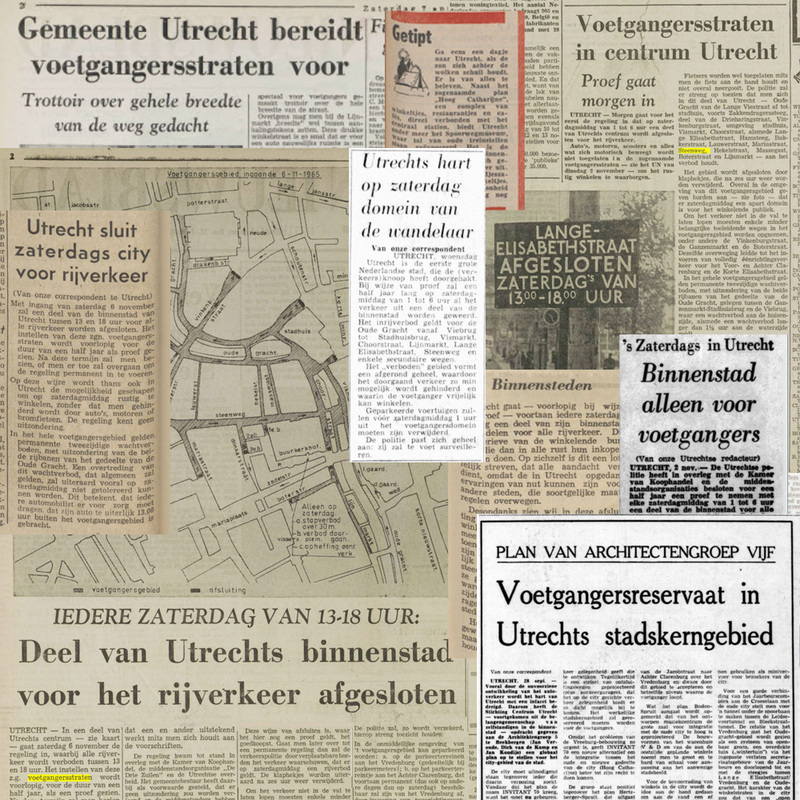 A collage of local and national newspaper clippings about the 1965 trial to pedestrianize the Utrecht city centre. Most of the newspaper articles reporting about the upcoming experiment were in an enthusiastic tone. Yet there were also some critical remarks. But this “ever-increasing number of cars” was the reason for this trial in the first place. First and foremost, it was the object of the police to give more space to pedestrians and to make shopping a much more pleasant (and safe) experience. And the police would change their ways too, as one newspaper reported: “The police will completely adapt to the new situation: they will do their surveillance on foot!” (Telegraaf 3-11-1965). The police did a good job, in the year of the trial only two minor incidents were reported of cars illegally entering the area. 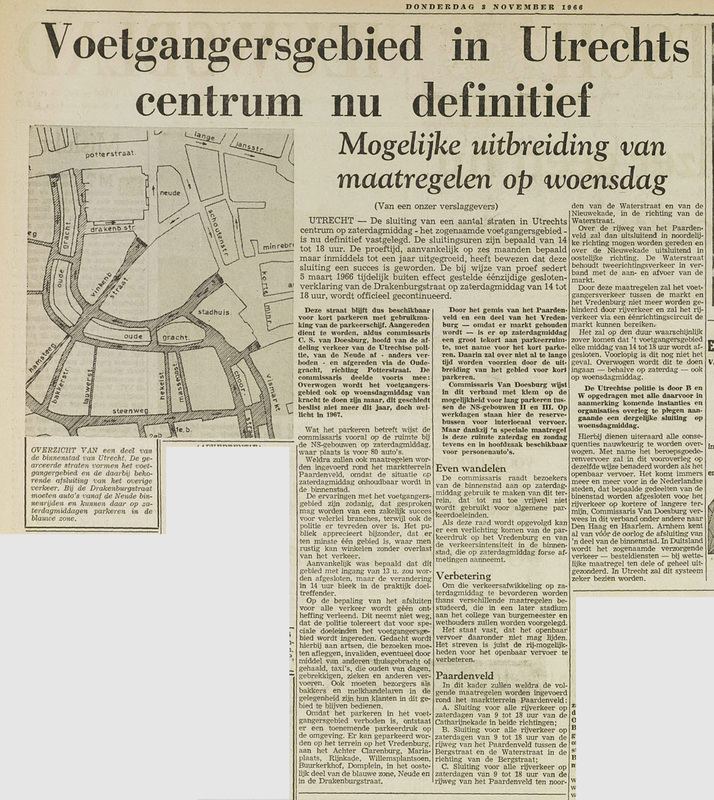 The report in the Utrechts Nieuwsblad of 2 November 1966 announcing the fact that the pedestrianized area would be definitive from then on. From my Dutch point of view it is amazing that people in other countries still believe pedestrianized streets would be a bad idea. That it would take life out of a street and that it would turn them into dead zones… as if motor traffic represents life… quite the opposite I would argue! And the people in Utrecht would have disagreed as well. Within a couple of years all the central Utrecht streets were made car free permanently and they have been like that for over 40 years. Already in 1975, the city advertised with the fact that shopping was really a great experience in Utrecht, without the noise and danger of cars. That business success is the conclusion of many a recent experiment as well. And that really may not come as a surprise. People on foot are the only people actually going into shops. No wonder that in those areas, where it is pleasant to be on foot, the shops flourish. 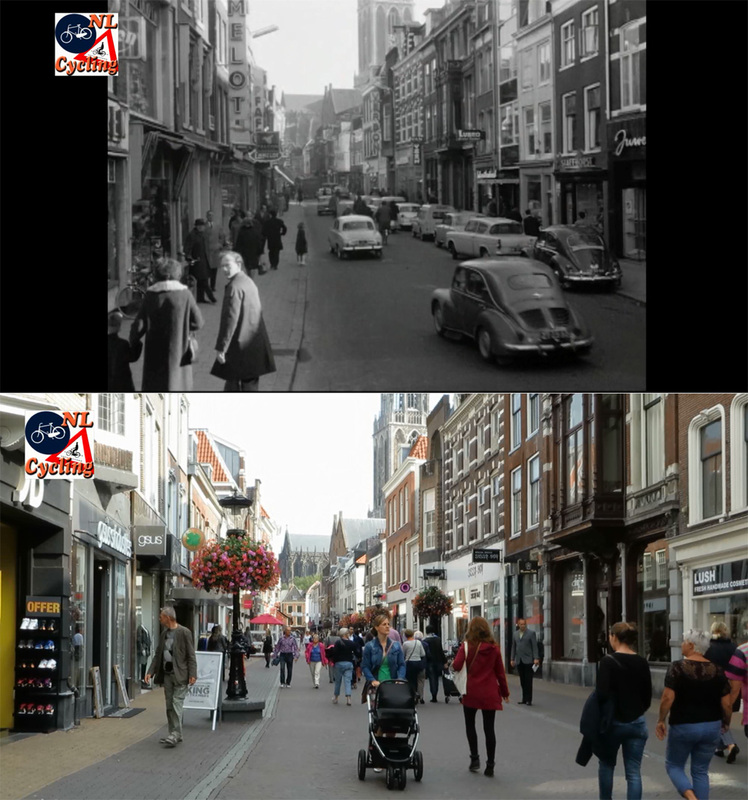 * The Utrecht Lijnmarkt in 1953 and 2014. About this street the local newspaper wrote in 1962, that the sidewalks were less than half a metre wide and that it was inevitable that the street had to be pedestrianized soon. Every now and then you hear that people would like to be able to cycle in the Dutch car free shopping zones. But – to my knowledge – only my home town ʼs-Hertogenbosch has allowed that so far. The city reports that this is a successful measure. I can vouch that it can be quite practical, when you have to be in the area. But in my experience, traversing it, at the adjusted very low speed, takes more time than riding quickly around it. So it may not be so terrible that these areas are closed to cycling. Steenweg in Utrecht. A street that has been pedestrianized successfully for 49 years today. It will be interesting to see if all the car free shopping zones will survive as they are now. Shopping habits are changing quickly with all the purchases made via the internet nowadays. Some towns already see a lot of vacant shops. Time will tell if the car free shopping zones in the Netherlands will stay successful the next half century. 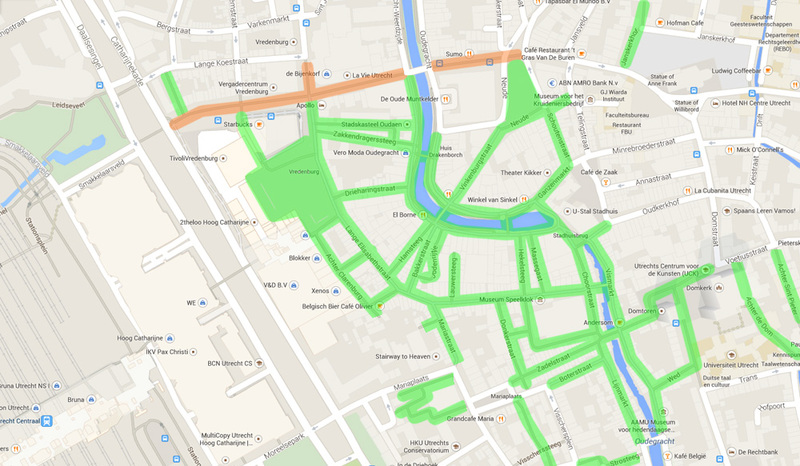 Today the car free zone is quite extensive in Utrecht. All the streets I highlighted in green are permanently car free. The orange line is a street for buses only. In some of these green streets cycling is allowed, but most are really only for pedestrians. I can agree with proper planning you can have a town free of cars. Good work on this urban planning. Another great video Mark, this time demonstrating that pedestrianising and modernising town and city centre shopping areas is very beneficial for virtually everyone. To me, the most important thing about town and city centres, is that they are people places. Pleasent, quiet, friendly and convinient places that put people first, especially for children and elderly people alike. Places that inspire you to actual want by choice to walk around them! Pedestrianising such areas does not negatively impact on business and retail, much the reverse in fact. I myself for example, would much prefer to walk and shop in a green, quiet, and unrestricted street, where people come first! Such pleasent urban areas will increase retail and business for certain. When any one town or city fails to provide such vehicle free areas for the free movement of people, then it has failed it’s purpose for existing primarily – that is, to attract and serve people. And cyclists of course! In the UK, some urban areas are improving in this way, but sadly not enough fast enough. Many British people seem to just ‘accept’ as the norm, noisy, dirty, unclean, heavily motorised central areas, or shopping streets, which lack character or any attractivness at all. NL is one of the more liberal and forward thinking nations that lead the way to excellent people infrastructure, as well as cycle infrasturcture. You often hear the objection for making streets car free that it is bad for business. That was also the fear for the Kalverstraat in Amsterdam before cars were banned in the 70s ( http://goo.gl/dU4xra ). In fact, access to the Kalverstraat had to be limited by the police a couple of times earlier this year, because it was getting dangerously overcrowded with pedestrians ( http://goo.gl/j8Emwa ). A problem indeed, but the lack of turnover was not the issue ( http://goo.gl/Z6WmUH ). When you consider sprawling suburbs are serviced by shopping malls – these are pedestrian malls, without any requirement of cars or delivery vehicles inside etc. And people struggle to extend that concept to pedestrian malls. Weird. You write “Every now and then you hear that people would like to be able to cycle in the Dutch car free shopping zones. But – to my knowledge – only my home town ʼs-Hertogenbosch has allowed that so far.” It’s far from the only one, I think. 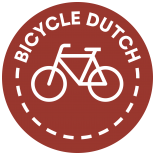 I checked 20 Dutch cities through streetview, and 9 of those (Zwolle, Apeldoorn, Alphen aan de Rijn, Middelburg, Roosendaal, Hengelo, Hilversum, Delft and Oss) allowed cycling, at least at the spot where I checked. 4 (Leeuwarden, Emmen, Alkmaar, Sittard) did not allow it. The other 7 (Groningen, Arnhem, Amersfoort, Haarlem, Dordrecht, Tilburg, Venlo) allowed it at some times only (outside shopping hours, sometimes in the mornings as well). Never mind, just drop my comments… I guess several of the cities will be like Utrecht, allowing cycling on some of the roads, not on others. I agree theat many cities allow cycling in some of their pedestrianized zones. Only ‘s-Hertogenbosch has said: all the pedestrianized streets may also be used by people cycling. And the people cycling are then ‘guests’, who should adapt their behavior (speed) to the pedestrians. This entry was posted on 6 November 2014 by Bicycle Dutch in Original posts and tagged car-free, history, urban planning, Utrecht.